I discovered Urban Sketching last summer at a workshop by Gabi offered through Kruckeberg Botanical Garden. I found out about the workshop accidentally by a birding friend of mine. I then attended my first sketch crawl at Jack Block park and since then have been blown away! What fantastic opportunities to share, learn and find new inspiration! And what enthusiastic and supportive artists and friends! Thanks to all of you for making me feel welcome! I have been a birdwatcher for years, thanks to an early date at a sewage treatment in North Dakota (sewage ponds are birding hot spot in early spring for migrating shorebirds!). That birder became my husband 35 years ago, and we have been birding ever since. We are active volunteers with Seattle Audubon, and Neil is their Outreach Coordinator which offers us both ample opportunity for environmental education. I am born and raised in Seattle. I was an art major my first three years of undergraduate studies at the UW, but ended up earning a BA as well as my MA in Norwegian Language & Literature. I then moved to the midwest where I was a college instructor for seven years back in Fargo/Moorhead. I ultimately decided not to pursue my PhD. I made a career change and applied my foreign language translation and literary interpretation skills to medical records. We moved back to Seattle in 1986 where I worked as a coder at Children's Hospital and Medical Center until 2000 and since then as a trauma Emergency Department coder for Harborview Medical Center. 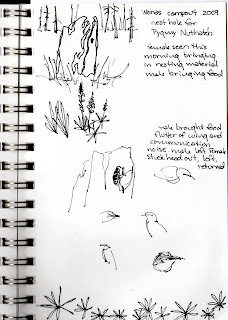 I discovered nature journaling and field sketching by accident ten years ago while on a birding trip to Malheuer National Wildlife Refuge. 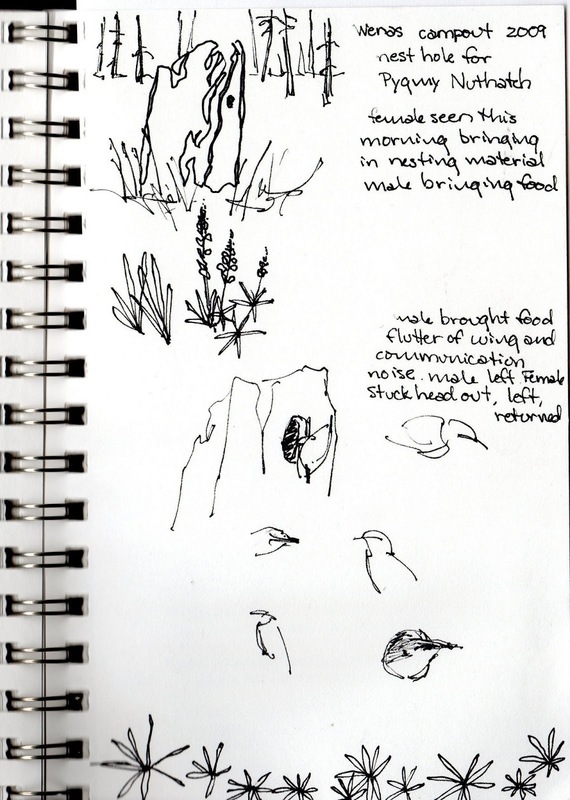 Since then the emphasis on my sketches has been to depict habitat as well as use art and language to record observations. I have participated in many workshops and have offered other workshops and classes through Seattle Audubon. I have organized activities for the last six years at the annual state Audubon campout at Wenas begun by environmentalist Hazel Wolf fifty years ago. And I have been a guest artist at Seattle Audubon's Nature Camp for 4-6th graders. My field sketching is always done on site and true to observation, so the urban sketcher manifesto was not a new concept for me. What urban sketching has taught me so far is to stretch myself, to sketch in public, to sketch people and events in urban settings rather than only non-urban or wild settings, and to learn to think geometrically so I can depict three-dimensional structures (I am still trying to wrap my brain around buildings and architecture!). 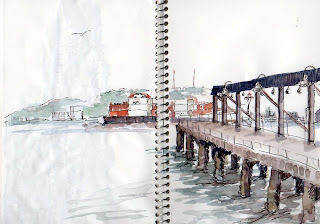 I hope urban sketching will continue to inspire my field sketching and nature journaling. It will always remain for me to sketch my community one drawing at a time, but in addition, to always show the relationship between the urban environment and our natural habitat. It is, after all, all about birds. I look forward to meeting you all. Thanks for inspiring me!